As widely rumoured, video calling feature on WhatsApp is coming soon -- rather very soon. The functionality has already made its appearance in WhatsApp Messenger app for Android for beta testers under the version 2.16.80. As expected, the WhatsApp video calling feature can be accessed by tapping on the phone icon placed at the top-right corner of the window inside a particular chat. While earlier tapping the icon directly initiated the voice calling, now tapping on the icon will give users the option to choose if they want to make a voice call or a video call to the person whose chat window is currently open. The option, for now, is only accessible from inside the chat window and not from the 'Calls menu'. 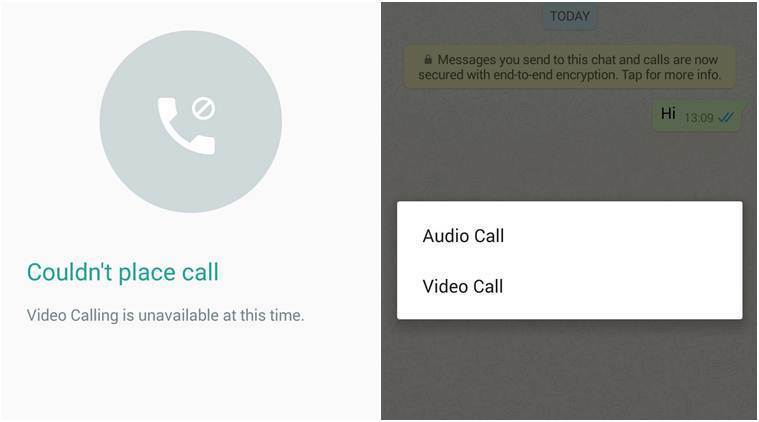 Also, presently though users can see the 'video calling' option they will not be able to make the call. As, on tapping on the video calling option, the app says it cannot place the call and adds "Video Calling is unavailable at this time." However, it is not difficult to assume that the feature will be added soon as the option can now be seen inside the app. WhatsApp’s video-calling feature is one that has been anticipated for quite sometime now, and once this launches it could give the app a significant edge over other messaging rivals. The video-calling feature is currently available on Snapchat, Facebook Messenger, Hangouts, KakaoTalk, Viber. Of course, Skype remains one of the leading options for video-calling for many users. But WhatsApp’s video-calling will be revolutionary in many ways. For starters, WhatsApp has close to 1 billion monthly active users, claims to be totally end-to-end encrypted and we’re assuming that given their obsession for privacy, they will extend the same to their video-calling feature. It also remains to be seen how they will optimise video-calling on WhatsApp given that the app is so popular in India where network connectivity remains patchy. Also will video-calling be supported on WhatsApp groups is another big question. The world's most popular instant messaging app is also expected to soon receive the 'call back' feature that will allow users to give a 'call back' later to the users whose calls they missed without even opening the app. WhatsApp may also get the voice mailing feature, where users can record voice mails and send it to others. Zip file sharing feature is also rumoured for the instant messaging app.